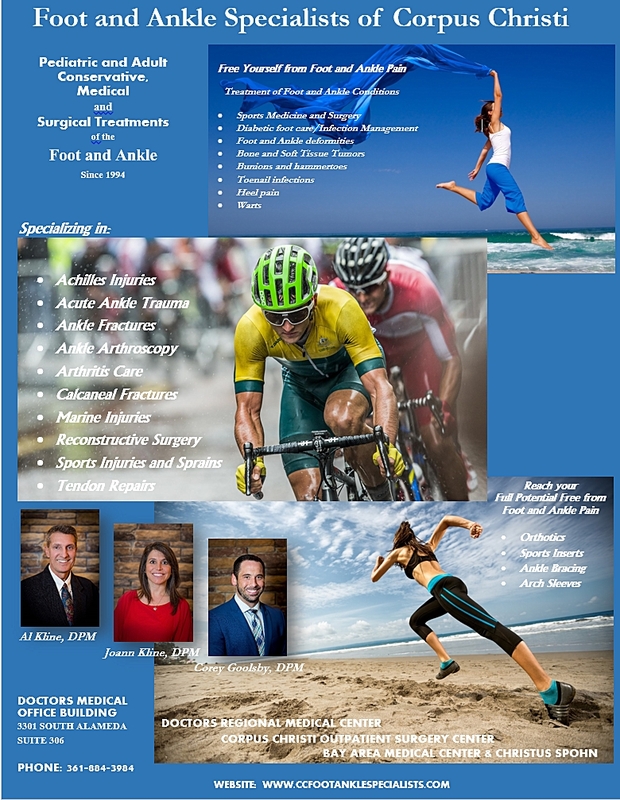 Established in 1994 (formerly Podiatry Associates of Corpus Christi), Foot and Ankle Specialists of Corpus Christi provide services in podiatric medicine and surgery of both the foot and ankle. This includes ankle and foot fractures, emergency care, sport injuries, treatment of heel pain, pediatric foot care, arthritis care, general foot and ankle fracture care, foot and ankle deformities, bunion surgery, correction of hammertoes and digital deformities, ingrown toenails, toenail fungus, diabetic foot care, diabetic limb salvage to patients in the immediate and surrounding coastal bend communities. We provide a variety of services including on-site x-ray, minor in-office surgical procedures, diabetic care, ulcer care, casting and orthotic construction. Our doctors strive to provide you and your family the latest, safest and most conservative techniques to address foot and ankle problems.